Welcome to my page for the The Winter Stars Teddy Bear Artist Online Show! 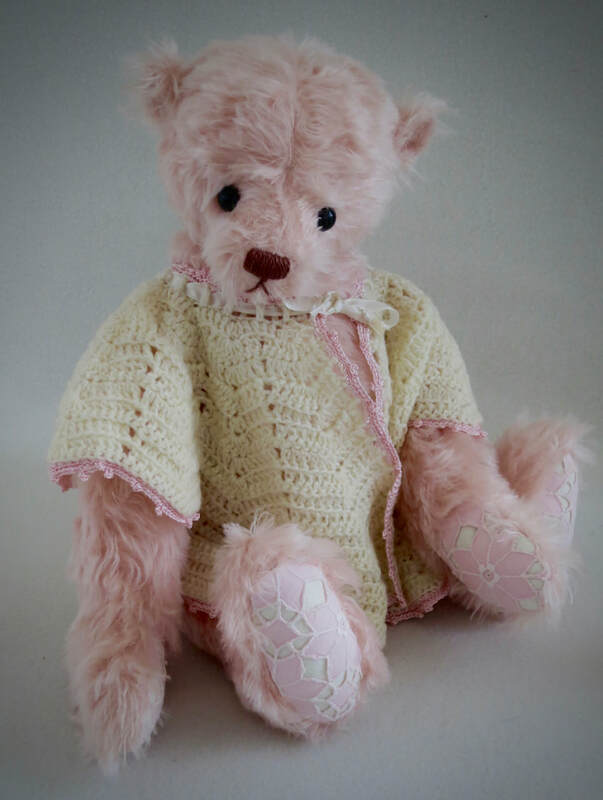 I have been designing and creating teddy bears and friends since the early 1990's. My teddy bears, and friends, are original designs. They may have cousins made from a varying mohair or with a variation of trim. Teddies and friends are created in a smoke free, dog friendly home. The Details: Blossom was created using English mohair. 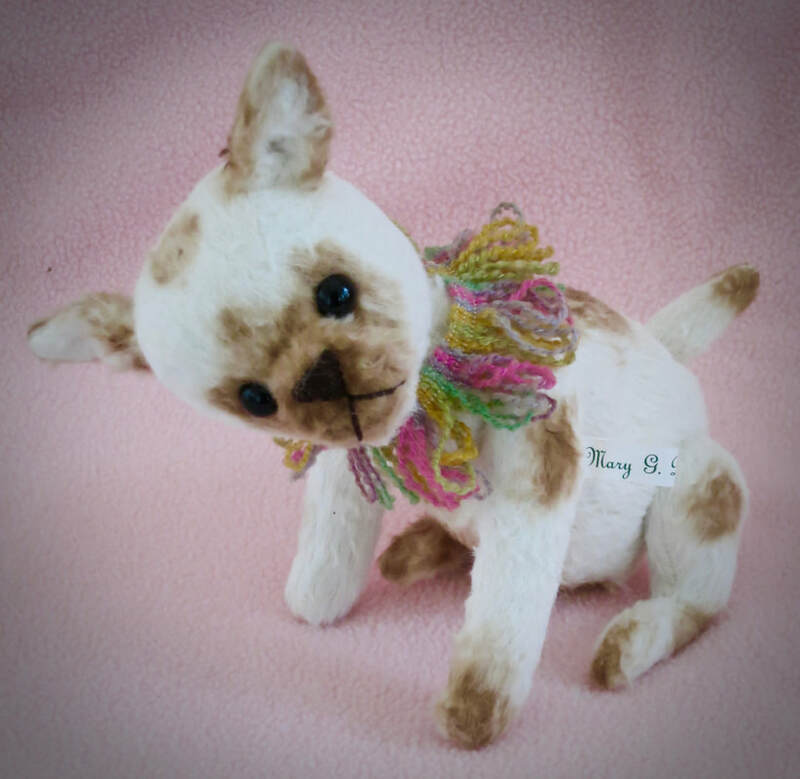 She has Premium glass eyes.Her paw pads are wool felt covered with vintage openwork fabric. Blossom is stuffed with Poly-fil & pellets. She wears a vintage hand crocheted sweater. The Details: Blush is made from a very pale pink short pile German mohair. She has premium glass eyes and waxed nose. Blush has been lightly air brushed. She is softly stuffed with Poly-fil and glass beads. 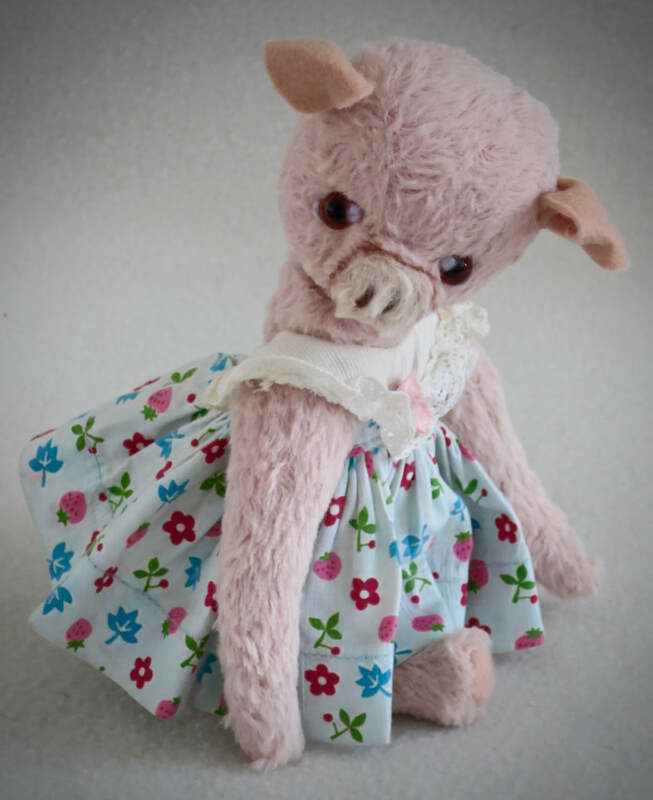 ​Blush wears a vintage dolly dress. The Details: Charlotte was created using hand distressed viscose and Merino wool felt foot pads. She has Premium glass eyes and hand accenting around her nose. Charlotte wears a vintage doll dress and is stuffed with Poly-fil and glass beads. ​Please select from the PayPal drop down window, for shipping rates to the USA or International. The Details: Muffin was created using hand distressed viscose. He has Premium glass eyes and air brushed accents. Muffin has been stuffed with Polyfil and glass beads. He wears a colorful neck ruff. The Details: Salt was created with short pile German mohair. He has Premium glass eyes and is stuffed with Poly-fil and glass beads. Salt wears a red velvet collar. The Details: Little Blue was created using hand distressed Viscose. He has premium glass eyes and skipped stitch nose. Little Blue has been antiqued to appear old and well loved. He is softly stuffed with Poly-fil and glass beads. Please select from the PayPal drop down window, for shipping rates to the USA or International addresses. The Details: Mimi was created using English mohair. She has Premium glass eyes and been stuffed with Polyfil and glass beads. Mimi wears a vintage dress with vintage ribbon sash. The Details: Roobarb was created using hand distressed viscose. He has premium glass eyes and has been stuffed with Poly-fil and glass beads. The Details: Ginger was created using short pile German mohair. She has Premium glass eyes, and skipped stitches nose. ​Ginger is stuffed with Poly-fil and steel beads. 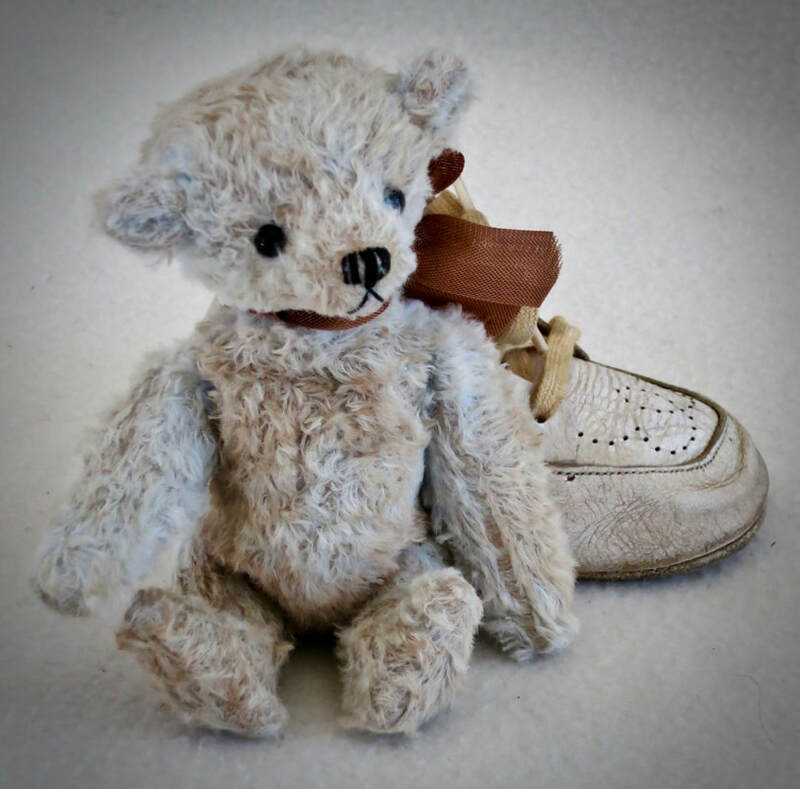 The Details: Sugar was created using German mohair with linen paw pads. She has Premium glass eyes and air brushed accents. Sugar is softly stuffed with Poly-fil and glass beads. The Details: Di Bunny was created using mini velvet. She has Premium glass eyes, skip stitch nose and fiber whiskers. Di is stuffed with Poly-fil and glass beads. She wears a hand knit dress. The Details: Victoria was created using two shades of vintage Mohair with vintage linen paw pads. She has Premium glass eyes and been stuffed with Polyfil and pellets. Please use drop down window for shipping rates to US and International addresses. I will ship any adoptions by 2-14-2019. US Priority Mail for domestic purchases and First Class for International orders. If shipping has been over estimated, I will refund any difference greater than $5.00.